In those comments, Sarah mentioned that the Bend Or spot on her Arabian, Dar, had the same three-dimensional quality that Sprinkle’s appaloosa spots have. I had a theory that perhaps the black hair grew at a different rate. But Prince’s spots seem to disprove this idea because they are flush with the rest of his coat. Here are some close-ups. So perhaps it isn’t about the color of the hair, but rather the density of the pigment. Appaloosa spots are densely pigmented. This is particularly obvious when an appaloosa has self-colored spots on a dark background. Many Bend Or spots have that same appearance, and those might appear three-dimensional in the winter. Prince’s spots are, however, clusters of black hairs mixed in with his normal color. Some of the spots have a higher percentage of black hairs than others, but they are all something a of a mix. If I had to guess, I would think that Prince was genetically a sooty palomino but that something was directing the black hairs to form spots rather than more usual patterns (dappling or all-over dispersion). 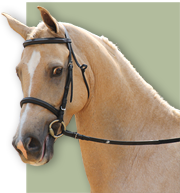 Rebecca Turner sent me some pictures of another odd expression of sooty palomino, and I’ll see if I can’t get permission to post those, too. He was another really unusual horse! If there is a pattern that has fascinated me more than the others, it would have to be splash overo. I first saw the pattern on a crop-out Welsh Pony (The Hot Spot) shown with the Pinto Horse Association in the late 1970s, and was intrigued since his pattern did not fit the commonly accepted rules for dividing horses into tobianos and overos. I encountered it again in both the original Sponenberg book Horse Color (1983) and the paper on “recessive spotting” in Finnhorses, written by V. Klemola in 1933. I began collecting information on anything that had what I considered the “classic” splash pattern. Those were horses that didn’t look like anything else but splash, with fully white faces, four white legs, two blue eyes, a white belly (not just belly spotting) that extended up the chest and neck, usually a white tail end, and clean edging to the pattern. Most often the horses were at least 50% white, so they were pretty hard to miss as being pintos. 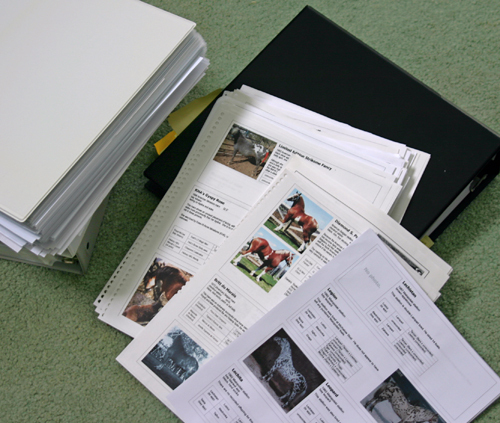 Over the years, these notebooks have grown to hundreds of pages with literally thousands of horses. (I am sorry to admit that they have not even kept close to the pace at which I have accumulated photos and information!) Among those are a large collection of these classic splashes from a variety of breeds. It was through a quirk of how I arrange the information that I came to believe that splash was not actually recessive, as many early writers surmised, nor was it a simple dominant as later studies proposed. I believe it is an incomplete dominant, and that the classic splash expression is what the pattern looks like when there are two copies present. That is because to help pin down the color line in my notes, horses in a pedigree known to carry a trait are printed in blue. Horses that have characteristics of the color or pattern are printed in green. So in the case of splashes, the names of obvious pintos are blue, whereas horses with blue eyes, or that have a history of producing a lot of blue eyes, or the right kind of face and leg markings, have names in green. My first task with any color was to at least rule the male or female side of the pedigree in or out. What I found maddening about the splashes was that I couldn’t even get that far. The trait just couldn’t be ruled out of either. It wasn’t until I had amassed a large number of these entries, spread across widely divergent breeds (including those thought not to have any other kind of white marking genes) that it dawned on me that this was my clue. The inclusion of both sides of the pedigree was the point. It probably came from both sides, just I I had come to see that the sabino whites were getting their coloring from both a sabino sire and dam. I later found that another researcher, Henriette Smit-Arriens, had already proposed just such a theory. (Henriette’s book, Farben und Farbvererbung beim Pferd, is probably one of the most comprehensive currently available on the topic of horse color, though sadly it is only in German.) What was interesting to me was that Henriette had been studying the one breed that I did not have access to records for at the time, which was the Icelandic. So we had come to the same conclusion using separate data groups. Since then I have seen it become popular to declare anything with blue eyes to be a splash. I remain skeptical, since I have encountered both sabino whites and Dominant Whites with blue eyes. I suspect that while blue eyes are uncommon in both sabino and Dominant White, I do not think that the trait can be completely excluded. (I do not think that the evidence supports the theory that all sabinos and all whites with blue eyes are also splash.) For that reason, it takes the appearance of a classic splash pattern to convince me that the original splash gene described in the early literature is actually present. Of course, that is a tall order since – if it is truly an incomplete dominant – the proof would require two separate lines of a presumably rare color to meet, or for one line to be inbred. The markings on these horses are pretty typical of what heterozygous splash looks like in other breeds. In many cases, the heterzygotes aren’t actually that loudly marked, and often do not even have blue eyes, though if you look at the family as a group many times there will be a tendency for blue eyes or blue segments in the eyes. I also greatly indebted to people like Jo-Ann who are intimately familiar with the colors in their breed. Their willingness to share this kind of information helps make the breed color charts, and the upcoming books, more complete and accurate.